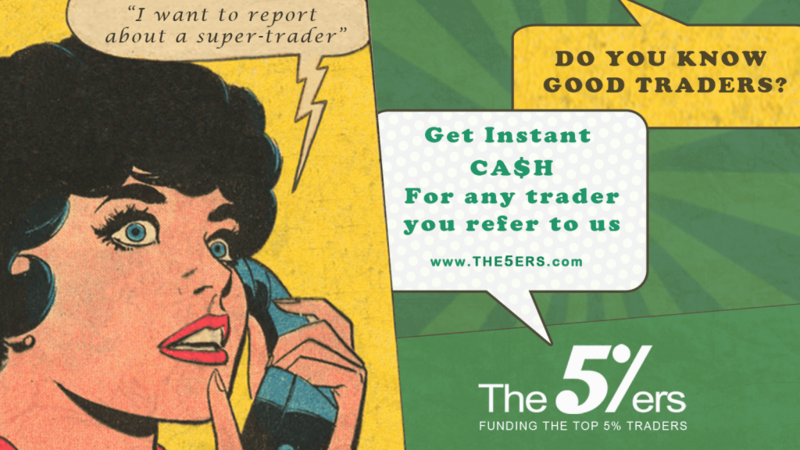 The5%ers rewards you for extending our reach to today’s top traders. We believe in showing gratitude and rewarding individuals who help grow our community of top trading professionals with referrals to The5%ers. There is no obligation to trade with us in order to be rewarded for a referring a trader, with the referral leading to the candidate's acceptance into one of our trading programs. Referrals will be instantly rewarded as soon as trader is qualified and enters one of our trading programs. Your referrals to us are priceless. Without your recommendations and referring your trading buddies to us, we may not have reached them on our own. In turn, we believe rewarding referrals with real funds, so you can earn for every contribution your bring to our community of top traders. We gain great satisfaction in offering immediate payment to individuals when deserved, so your commission for referrals is paid on the same day the candidate completes their signup process with us. Your first trader referral earns you 5% of new trader's signup fee, 10% for the second referral, and 15% for the third referral and following. With every trader account completed and meeting qualification requirements, we pay the referring individual the same day via PayPal, for leveraged security and quick turnaround. Below, you may signup to receive your unique referral URL. Once you receive your link, you may publish it in your website, social networks, forums, or in your trading groups such as Skype, Telegram, Whatspp etc... Any trader who signup thru your link will be associated to you. Your referral payment will be sent automatically to your Paypal account, upon the referral program terms. A trader must signup through the provided URL Link to qualify for a referral payment. Referral payment will be sent once the signup payment is cleared. It may take from 15 minutes to 3 weeks, depends by the payment method. Referral reward will be denied in case the trader was introduced before by another referrer. In that case the first referrer is eligible for the referral reward. Referral payments are increased as follow: 5% of signup fee for the 1st referred trader, 10% for the 2nd trader, 15% from 3rd and up. Payment will be sent automatically by the fund, to the specified Paypal account. If commission reward exceeds $500 per month, the referrer should produce and invoice.